In July of 2008, at a regional high school in a small town in central New Mexico, a group of educators met in a seminar to explore the possibility of assisting the teaching of math using that ancient bead-frame calculator, the abacus. Given the reality of simple calculators built into every cell phone, and complex scientific graphing calculators readily available, as well as the ubiquitous computer, it begs the question “why?” Here was found a room full of educators who were intently practicing adding and subtracting columns of numbers using abaci built from craft sticks, beads, cardboard, bamboo skewers and white glue. Hardly the stuff of high technology. Low tech enough, in fact, that any school-aged kid could build one. Which was exactly the point. Recently, the United States Department of Education reported that the achievement levels of US elementary, mid and high school students in mathematics had fallen to an all-time low as compared against students of equivalent age in other countries. Among the standout countries on that list were those, such as Japan, Taiwan and Singapore, who employ a regular curriculum of mathematics, that includes the teaching of the principles of the abacus. We would hardly consider the level of technological expertise in countries such as Japan as being primitive, or the achievements of its educational system as lacking. Yet the abacus, or soroban, although a fundamental tool of math education in Japan, is commonly looked down upon in countries such as the US as being just that. Here we find the prevalent notion that an abacus is a simple infant’s toy of rows of ten colored beads, useful only for the drool-soaked fingers of the child to manipulate until the video game console can be mastered. At the abacus seminar our instructor, Cecilia, began by familiarizing the adults with the various parts of the abacus. In each column of beads there are four beads below the horizontal dividing bar, and one bead above. The upper, or ‘heaven’, beads have a value of 5, while the lower, or ‘earth’, beads each have a value of 1. Calculations begin by the abacus being ‘cleared’, which is performed by moving both upper and lower beads away from the dividing bar by tilting the abacus up from the horizontal, allowing all the beads to slide down their rods; then, returning the abacus to the table’s surface, one’s finger rapidly runs along the upper edge of the dividing bar, clearing the upper five’s beads in one deft move, rendering a satisfying clattering sound. The physical, tactile qualities of the abacus, its gently clattering beads and elegantly smooth motions along the bamboo rods, are soon evident to even the most skeptical of adult students, as it soon becomes apparent that these tactile qualities operate within a Zen-like, holistic manner, calming the fears and distractions of the novice while focusing the mind on the operation at hand. Just as the Zen archer concentrates not on ‘hitting the mark’, but rather on one’s breathing and carefully practiced movements of the fingers, hand, wrists, arms and shoulders, eventually arriving at a place where release of the arrow to the center of the target is merely inevitable, so too does the abacus operator concentrate, not on the ‘answer’ to the problem but rather, on the execution of specific rules for entering – the laying on – and removing – the taking off – of numbers. Cecilia, our abacus instructor, is an educator who has a vision of bringing the teaching of the abacus into the curriculum of even the most problematic of US school systems. A native of Taiwan, she learned the abacus not as a child but as an adult, and delivers her vision with a carefully focused passion that is evident through her thickly accented speech. Her strategy is that children must be taught the abacus through their teachers, and these teachers – adults who are products of the US higher educational system – must therefore be taught, not only the principles of operation, but become mechanically adept in its use, and also must be instilled with a vision and passion for the intrinsic worth of the instrument. Numbers are entered onto the abacus by pushing the beads of respective value toward the horizontal dividing bar, the heaven beads being flicked down to the bar using one’s index finger, while the earth beads are pushed up to the bar using the thumb. Like many other parts of culture that have become as much art as craft, there have been developed specific rules of usage for this ancient instrument. In order for the remaining fingers of one’s right hand not to interfere with the movement of the beads, it is required that they be folded back, permitting only the thumb and index finger to extend, in a pinching motion like that of a crab, which Cecilia illustrates with humor. Additionally, the grip thus formed becomes a convenient place to locate one’s pen or pencil, used to record the results of the calculation onto the test sheet or check book ledger. When removing beads, the index finger alone is used. In little time this group of veteran professional educators has progressed to the point where they are intensely enjoying the tangible movements of fingers upon beads, as they record the values of numbers spoken aloud by Cecilia into the physical placement of beads on rods. Though some of these adult abacus students remain doubtful of the abacuses utility in contemporary culture, as is evidenced by conversations during our break, it is simultaneously observed that even the most skeptical of these hardened educators is found to be having fun. Plain, simple, old-fashioned fun. Part of this aspect of fun is not only the physical, tactile, even sensuous, pleasure of manipulating beads using one’s finger tips, but also the mental challenge one encounters when the current operation requires the use of complementary numbers. And the fact that they are having fun has not been lost on these educators, who strive daily to find ways of making math instruction fun and accessible to their students. 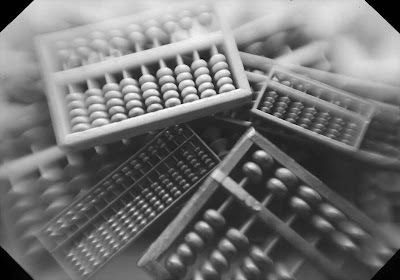 The abacus is a digital recording device, one whose physical technique of representing numerical values is not some analog representation, as would be the case of the slide rule, but relies on the principle of Boolean logic: a bead, or groups of beads, can only be in one of two possible states: either in a ‘cleared’ position, away from the bar, or an ‘entered’ position, toward the bar. While the various rods of the abacus are used to represent the place values used in the decimal system – a rod representing the units column chosen by the operator, with the tens and hundreds column to its left – the structure of the beads’ configuration upon the rods requires that some unique rules be followed during some combinations of number entry. This is because the abacus uses merely five beads on each rod to represent ten numbers – 0 through 9 – by employing the heaven beads as value multipliers in an arrangement called the ‘quinary’ grouping system. The numbers 1 through 4 are entered by directly pushing the respective number of earth beads up to the bar. For values between 5 and 9, combinations of heaven and earth beads are used, such that in the case of 7, a heaven bead (having a value of ‘5’) and two earth beads (a combined value of ‘2’) are simultaneously moved toward the bar, giving an overall value of ‘7’ in that position. The process of adding and subtracting numbers is what transforms the abacus from being a mere cultural curiosity, capable only of representing or storing number values by bead positions, into that of a practically useful tool for everyday use. Yet the process of entering or removing a succession of number values upon the bead frame can be at one moment pleasingly simple, while at other moments devilishly complex, often both in the same operation. This is because one frequently finds a lack of additional beads required to complete number entry or removal, due to the abbreviated representation of the quinary grouping system. When this happens the operator must use one of three possible rules, in effect exchanging a higher position bead for those actually needed, a more sophisticated method of what we know as regrouping, or borrowing. These techniques of exchanging beads between neighboring rods in order to complete an operation are generically known as ‘complementary’ operations, since their employment requires the operator only to know the complement of a number, rather than memorizing the entire addition tables. Cecilia’s students soon learn that the complement of a number is a second number which if added to the first makes a value of 10. These are known as ‘tens complements’. An example reveals one method for employing complementary numbers, which is in a problem such as ‘3+8=11’. First, the value of 3 is entered on the units’ column, by pushing up three earth beads with the thumb. Next it is noticed that there are not enough beads left on the units’ column to directly enter ‘8’. Instead, the complement of ‘8’, which is ‘2’, is subtracted from the units’ column, while simultaneously an earth bead on the tens’ column is entered, by using the thumb and index finger in a twisting motion. In the symbology of mathematics the problem of ‘3+8=11’ has been transformed into ‘3+(10-2)=11’, but the operator is not consciously aware of this; rather, the simpler rule of performing the opposite operation upon the complement of the number, and then adding a bead in the next higher place value. It also becomes obvious that subtraction is performed in an inverse manner to addition, with the complement being added, and the ‘ten’ bead being subtracted. After our lunch break, comprised of Chinese noodles and rice, cooked by Cecilia and offered as a way of exposing the westerner to a more thorough immersion in Asian culture, of which the abacus is a vital part, we sit at our desks and construct our very own abacus using the simple materials found in one’s home or at the craft store. Starting with a rectangular base cut from recycled cardboard, we glue craft sticks into place to form the upper and lower frames and dividing bar, then string colored beads onto bamboo rods and glue these on top. Dots are drawn onto the wooden frame at intervals so as to represent the decimal point, and the comma at the thousands’ rod. In a few minutes the glue has hardened sufficiently so as to permit our handcrafted bead frame calculators to be used in actual operation. One can imagine a room of students customizing their own abacus with a unique combination of colored beads, paint, markers and other decorations. Perhaps young boys will find black paint and skull-and-crossbones beads a useful way to transform the drudgery of math into the fun of the Jack Sparrow Calculator, replete with pirate-themed décor. But we must not be distracted by such mental fantasies, for we have more learning yet to do if we are to master addition and subtraction. Cecilia is now teaching us the way of the combined fives/tens complements problems, perhaps the most difficult part of learning addition and subtraction on the abacus, and found while performing such problems as ‘6+7=13’. In the notation of mathematics the short cut that Cecilia teaches her students is equivalent to ‘6+(10-(5-2)=13’, but they are not aware of that level of complexity; rather, they employ the simple rule requiring them to add the earth bead in the tens’ column and then merely ‘push up’ the value of 7 on the units’ rod by moving the heaven bead and two earth beads in the ‘up’ direction. Subtraction is the inverse, in which a single earth bead is removed in the tens’ column and the value of 7 is ‘pulled down’ on the units’ column. Cecilia soon begins giving her students problems involving complements orally, and the students conveniently find that the numbers can be entered onto the abacus in the same order as they are spoken, from left to right, just as with using an electronic calculator, with the difference being that in the case of the abacus there is no need to punch the ‘=’ key at the end of the operation. Rather, the abacus rules of entering and removing numbers cause the answer to ‘form itself’ as the sequence of operations is being performed. These professional math instructors also notice that the physical structure of the abacus, combined with the rules of operation, provide a tangible method of illustrating to their students the principles of grouping, place value, logic and complements. It is obvious that the abacus is a handy, fun instructional aid in the classroom. What is not yet so obvious, but will be when they begin applying the abacus to their math curricula, is that in order to adequately teach the abacus to their students they first must be versed, and well practiced, in its operation; and that to do so will require them to constantly practice the abacus on their own time, in their private life. Thus the question arises as to the merits of the abacus as a practical tool for quickly performing simple math problems that may arise daily, without resorting to grabbing an electronic calculator, firing up a computer or fumbling with a cell phone. It’s not really a question of expediency or efficiency, as these more contemporary methods of arriving at an arithmetic solution may be equally or more efficient, time-wise. The more fundamental issue is about intrinsic worth. If intrinsic worth itself lacks intrinsic worth then the consumption of coffee, soda and tea can be more efficiently replaced with a small pill containing caffeine; or the printing of books and periodicals can be entirely dispensed with, in favor of E-books; or the procreation of the species be more efficiently conducted by laboratory technique. No, the issue with the abacus is not merely one of efficiency or utility, although it does possess many fine attributes; the value of the abacus is that it serves a utilitarian purpose all the while remaining simply elegant. As with all fundamental tools, the abacus at its core displays an intrinsic beauty. That’s it, in the simplest terms available: beauty. An elegantly simple tool whose beauty of design, construction and operation resonates with our biological programming as toolmakers and users. And that, in the final analysis, may help explain why adepts of the abacus find use of the instrument addictive, and why educators are beginning to discover the importance of incorporating beauty into their classrooms. For beauty is the stuff that the human spirit strives to achieve.